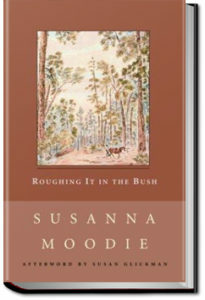 ‘Roughing It In the Bush’ is Susanna Moodie’s account of how she coped with the harshness of life in the woods of Upper Canada, as an Englishwoman homesteading abroad. Her narrative was constructed partly as a response to the glowing falsehoods European land-agents were circulating about life in the New World. Her chronicle is frank and humorous, and was a popular sensation at the time of its publication in 1852.